By Cameron van den Heuvel, pictures by Adrian Ecker & Cameron van den Heuvel. 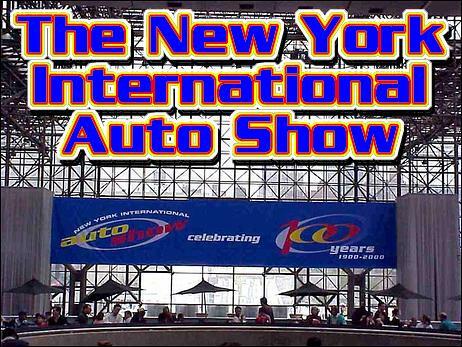 The first New York International Auto Show was held in 1900, displaying 160 cars and attracting 48,000 visitors. This year's Auto Show marked its 100th anniversary by showcasing over 1000 vehicles from 36 manufacturers to a crowd exceeding 1.2 million visitors. The venue was the massive Jacob Javits Center on Manhattan's West Side. The American auto show "season" begins early each year in Detroit to dominate new car launches and industry announcements. Following Chicago and Los Angeles, New York is traditionally the last major show, with debuts of next year's models and concepts that were not previously ready. Following are some of the new vehicles and associated technologies from this year's New York Auto Show. Now in its 10th year, the hand-assembled NSX is marketed in the US under the auspices of Honda's premium subsidiary, Acura. This year's manual transmission model has been refined, with an enhanced close-ratio 6-speed gearbox and new perforated leather interior. The model on show was an NSX-T, with a removable aluminium hardtop. The all-aluminium 216kW, 3.2 litre DOHC V6 Honda VTEC engine with 305Nm of torque now also complies with Low Emission Vehicle (LEV) standards. The DB7 is now the most successful Aston Martin model ever, having sold over 3000 units. At the New York Auto Show, a single Racing Green DB7 Vantage Volante was on display. This car is powered by a 313kW 6.0 litre V12 Aston Martin engine that rapidly propels the car to a maximum governed speed of 266 km/h. Transmission options are a 5-speed ZF Touchtronic push-button automatic or a six speed manual transmission. All Aston Martins are produced to individual order, with unlimited choices of colour for paint and interior leather upholstery. First seen in Geneva, Audi's Allroad Quattro wagon made its North American debut in New York. A car-based SUV, the Allroad Quattro is a unique hybrid with height-adjustable air suspension, Quattro all-wheel drive and 6-speed manual or 5-speed Tiptronic transmission. Another new Audi is the convertible version of its distinctively styled TT, dubbed the TT Roadster. The 2001 TT Roadster and Coupe will be available with an optional new 168kW, 1.8 litre, 20 valve turbocharged and twin-intercooled engine and Audi's constant quattro® all-wheel drive system. The manual 6-speed transmission, full-time traction control and an electronic differential lock allow acceleration from 0 to 60 mph (97km/h) in 6.7 seconds, while anti-lock brakes rapidly bring the car back to a halt. The soft top with heated rear glass window can be opened in one step and stowed behind the seats. A retractable windbreak reduces interior turbulence. Two aluminium rollover bars are integrated into the body structure and contribute to the Roadster's overall safety and structural rigidity. Other features of the Roadster include new leather upholstery, dual-front and supplemental airbags, premium Bose audio, all power options, alarm, and 17-inch alloy wheels. BMW's last 3-series flirtation with all-wheel drive was the 1991 325ix. Like the current X5 "Sport Activity Vehicle", the 330xi has a constant power split of 38% front and 62% rear. This provides constant drive to all wheels while retaining the feel of BMW's traditional rear wheel drive. The 330xi's all-wheel drive is controlled electronically via interconnected ABS, traction control, a special version of BMW's Dynamic Stability Control (DSC-X) and Automatic Differential Braking (ADB-X). This system is said to be comparable to four-wheel drive with mechanical, electromechanical or electrohydraulic locks, without any disadvantages of these conventional systems. The US-spec 330xi is fitted with the new M54 inline 6-cylinder, 3-litre engine producing a maximum of 168kW, an engine which returns identical fuel consumption as its 2.8 litre predecessor. Streamliningthe air intake and modifications to the unique double-VANOS variable timing system have provided additional power gains. BMW has also raised the ride height by 18mm over standard 3-series sedans, "to cope with field, forest and other offroad paths". Only 300 Mustangs are destined to be converted to Cobra R's, but they will be the fastest, best handling Mustangs ever. Replacing the standard motor is a 287kW 5.4 litre 32-valve DOHC Ford V8, mated to a Tremac 6-speed manual transmission. Power is put to the road through 18 x 9.5 inch wheels and tyres, while Brembo 4-piston aluminium front calipers enhance braking duties. Suspension changes include uprated Eibach race springs and help set a new mark for handling in this car's class. The basic Mustang body has been fitted with a rear wing and front splitter to reduce axle lift and increase stability, especially when approaching its top speed of over 274 km/h. The 2000 Eclipse sports coupe features new engine options, a Sportronic automatic transmission that allows clutchless manual shifting and Mitsubishi's "geo-mechanical" styling. The new generation US-assembled Eclipse has increased body stiffness and suspension performance while maintaining comfort levels. Engine options include an 115kW 2.4-litre SOHC 4-cylinder, or a torquey 153kW 3-litre SOHC (per bank) V6. The convertible Eclipse Spyder shown was actually a project vehicle developed by aftermarket supplier HKS. The fitment of a HKS turbo, HKS Super Mega Flow cold air intake and Drager exhaust to its decompressed 2.4-litre engine raised its output to over 150kW. HKS are currently developing commercial turbo and body kits for the 2000 Eclipse. The new 911 Turbo shows the inevitable consequence of many decades of engineering development - it is an exceptional performer in nearly every aspect. A new 3.6-litre 6-cylinder turbocharged engine develops 310kW and 564Nm(!) of torque. The 911T with manual 6-speed transmission is capable of accelerating from 0-60 mph (97 km/h) in just over 4.2 seconds, stretching to just under 5 seconds with the optional 5-speed Tiptronic S gearbox. Some cutting-edge technologies are standard, including Porsche Stability Management, constant four-wheel drive and VarioCam Plus variable valve timing. A new Porsche Ceramic Composite Brake system is optional. This little-known Modena manufacturer produces the Ferrari-challenging Mangusta. It has a unique "Rototop" system that transforms the car from Coupe to Targa to Cabriolet at the touch of a button. The powerplant is a cast aluminium Ford 4.6-litre V8, which produces a maximum of 239kW at 6000 rpm and peak torque of 427Nm at 4800 rpm. The drivetrain consists of a 5-speed manual gearbox and a limited slip rear differential. Power is put to the road though 17-inch or optional 18-inch ZR tyre-shod wheels. Braking performance is exceptional thanks to four piston Brembo calipers grabbing 324 x 32 mm front and 310 x 28 mm rear ventilated discs with 4-channel ABS. Luxury and safety features include dual air bags, leather interior, all power options, alarm and a premium Nakamichi sound system. Undoubtedly among the most expensive vehicles on display, Rolls Royce showed the new Cornice Convertible valued at US$360,000. It is equipped with a 242kW turbocharged V8 engine, and is matched with a luxurious leather interior, refined ride and precise handling. Behind the Corniche in this picture is a silver Bentley Arnage Red Label sedan, with a turbocharged 6.75 Litre, 300kW V8 engine. The Arnage continues the astounding performance tradition of the Bentley "Blowers"; these cars won the LeMans 24 Hour race each of the five times they were entered. Toyota, along with Rod Millen Motorsports and Toyota Racing Development (TRD) has engineered a 370kW, all-wheel drive Celica. The engine is a 2.0-litre DOHC derivative of the Celica powerplant used in Rod Millen's own Pikes Peak hill climb cars, producing 373kW at 8000 rpm and 462Nm of torque at 5500 rpm. A custom all-wheel drive Toyota powertrain with 5-speed manual transmission and Toyota/Bilstein suspension replace the standard items. A rollcage, race-inspired brakes and fuel bladder, Recaro front Sport seats, voice-activated audio/GPS system and uniquely-styled body panels were also custom installed to make this the ultimate Celica. The third evolution of the mid-engined, rear-drive MR2 is a 2-seat softtop roadster designed to appeal to a younger, budget-oriented demographic. Weighing about 1000kg, the wide and low-slung MR2 is powered by a new 103kW, 1.8-litre DOHC 4-cylinder engine with VVT-i variable valve timing, also available in the Celica GT. For just over US$23,000, standard features include a 5-speed gearbox, 15-inch alloy wheels, 4-wheel disc anti-lock brakes, power locks and windows. Cars of the future, today? Manufacturers are increasingly introducing technologies that are not only less harmful to the environment but also require no compromises in terms of performance, utility or cost. It is now apparent that this is important not only in high-pollution cities like Los Angeles, Tokyo and New York, but globally. The following are some examples of "green" technologies that were on show. The luxurious 750hL can be powered by both hydrogen and gasoline; its 5.4-litre V12 engine produces approximately 152kW with either fuel. Hydrogen is liquid only at temperatures below minus 423&°; F and is thus stored in a supercooled fuel tank. However, little other modification is necessary as hydrogen burns the same way as gasoline in a conventional engine. For additional benefit, BMW has replaced the normal lead-acid battery with a 5kW fuel cell that generates all power and is capable of operating the air conditioning even without the engine running. Since 1978 BMW has been developing hydrogen powered engines, which produce only oxygen and water vapour (steam) as by-products of combustion. BMW is now approaching the same levels of utility with this technology as modern gasoline engines. The 750hL is fuel efficient; the 750hL can travel up to 186km on one tank of liquid hydrogen, and compliant with all safety requirements including collision tests. Currently, a fleet of 750hL cars is being produced for an Expo2000 project for use between Munich and Hanover. It is hoped this will further demonstrate the suitability of hydrogen power for daily use on public roads. In April, the American Honda Company increased availability of its new Insight gasoline-electric hybrid car, to about 6,500 vehicles this year. The Insight is currently the most fuel-efficient car sold in the US - on regular unleaded fuel the mileage is 3.85 litres/100 km city and 3.36 litres/100 km highway. The 2-seater's primary propulsion is by means of an ultra-narrow, 60mm wide, permanent magnet 10kW motor powered by a 144 Volt Nickel Metal Hydride (NiMH) battery pack. Uniquely, this car never needs external energy for recharging - an inconvenience associated with past consumer electric vehicles. An integrated gasoline engine and regenerative braking always maintain sufficient battery charge. Honda's Integrated Motor Assist (IMA) enlists the help of the Honda VTEC™-E 1-litre 3-cylinder Lean-Burn engine to provide added performance when needed. Peak horsepower and torque figures with the engine assisting the electric motor are 55kW at 5700 rpm and 124Nm at 2000 rpm, respectively. The gasoline engine is ULEV-certified by the California Air Resources Board. The car retails for less than US$19,000 and is equipped with a 5-speed manual transmission, dual front air bags, automatic air conditioning, all power options, trip computer and many other features. Styling is reminiscent of Honda's current Civic at the front and has glass rear hatch reminiscent of its past CRX. The 2000 Sentra is a new global platform sharing floor panel, engine, transmission and chassis components with six other Nissan models in Europe and Japan. In the US, it has an equivalent niche to that of the Nissan Pulsar in Australia. In limited production and so far available only in California, the Sentra CA (Clean Air) model is the first gasoline-powered car to be certified by the California Air Resources Board (CARB) to receive Super Ultra Low Emissions Vehicle (SULEV) and zero evaporative emissions credits. The CA is claimed to emit fewer harmful vapours when driven 32km per day than a standard car sitting in a driveway all day with its engine turned off! The Sentra CA is equipped with a Nissan 1.8 Litre DOHC engine producing 91kW at 6000 rpm and 166Nm of torque at 2400 rpm, which is only slightly down on the output of the 1.8 litre engine fitted to non-CA model Sentras. A number of engine and emissions technologies make the CA the world's cleanest gasoline-fueled car, with exhaust 75% lower in hydrocarbon levels and 90% lower in oxides of Nitrogen (NOx) than the cleanest (ULEV) gas-powered automobiles currently sold in California. Specifically, the new technologies include double-wall exhaust manifolds, new combustion control sensors, rapid warm-up 3-way catalytic converter, hydrocarbon trap catalysts, a non-return fuel system and an electronically controlled swirl valve. In addition, the radiator is coated with a catalyst to convert harmful ground-level ozone, the main component of smog, into oxygen molecules. Thus, the air should be cleaner behind the car than in front. The Sentra CA may become available in other US states in the near future.